Kerry Brougher, Director of the Academy Museum of Motion Pictures, announced on Tuesday the details of the inaugural exhibitions that will be on view when the Museum opens in late 2019. “Where Dreams Are Made: A Journey Inside the Movies” (working title) will occupy two floors of the Museum’s iconic Saban Building—formerly known as the May Company building—and looks at the development of the art and science of motion pictures. Brougher also announced the institution’s first temporary exhibitions. The Museum will open with “Hayao Miyazaki” (working title), presented in collaboration with the filmmaker’s Studio Ghibli — the first major exhibition of his work presented in the United States. This exhibition will be followed by “Regeneration: Black Cinema 1900–1970” (fall 2020), a groundbreaking exhibition that reveals the important and under-recognized history of African-American filmmakers in the development of American cinema. It will explore African-American representation in the motion picture from its advent to just beyond the Civil Rights era. The Museum’s 34-foot-high project space will open with a major work by the Tokyo-based interdisciplinary art collective teamLab. Additional exhibitions will include “Making of The Wizard of Oz,” featuring elements that contributed to the creation of this iconic film, a history of the Academy Awards, and an Oscars experience. “Where Dreams Are Made” will unfold over 30,000 square feet on two floors of the Museum. It brings together evocative settings, key objects from the Academy’s unparalleled collections and the growing collection of the Museum itself, and an array of film installations. The journey begins in the Spielberg Family Gallery, located in the Grand Lobby, with the installation “Making of The Wizard of Oz.” This classic 1939 film is notable for its engaging story, groundbreaking effects, glorious Technicolor world, original musical score — in particular the exquisite voice of Judy Garland — and a cast of unforgettable characters. Visitors will experience the magic of the movie and explore the process of its creation, from the script to production design drawings and sketches, costumes, and hair and makeup tests to the final versions of the characters themselves. It is here that Dorothy’s famed ruby slippers from the Museum’s collection will be found. Finally, evidence of this film’s everlasting impact illustrates the impressive legacy of The Wizard of Oz in popular culture. Visitors will then ascend to the Wanda Gallery on the second floor, where they will enter a corridor that acts as a transition from the real world into the dream-space of cinema. They will emerge into the dramatic Magic and Motion gallery, which evokes the age of innovation and wonder in the 19th century during which inventors created optical illusions and animations with devices that delighted audiences by making still images move and light up, bringing scenes and tales to life. The Lumière and Méliès gallery introduces a central theme of the exhibition—the interplay in cinema between realism and fantasy — as seen in the work of the brothers Louis and Auguste Lumière on one hand, and Georges Méliès on the other. Visitors will experience some of the earliest films ever projected, brief glimpses of daily life that were the forerunners of today’s documentaries and travelogues with which the Lumière brothers astonished audiences all over the world. The delightful “trick” films and dazzling moving image fantasies of stage-magician-turned-filmmaker Méliès prefigured the limitless potential of cinematic imagination even as the medium was still in its infancy. The Story Films gallery inside the restored iconic golden cylinder of the Saban Building will demonstrate how filmmakers around the world quickly developed camera and editing techniques that unleashed this new medium’s potential to tell stories. Visitors will see examples of the first dramas, comedies, adventures, and other genres created for the screen, as well as the first animated short films. Women played significant roles both in front of and behind the camera during this period, and this gallery’s focus on early pioneers such as Alice Guy-Blaché and Lois Weber will not only explore their stories but also survey an industry in the process of being born. In the Modern Times section, visitors will encounter three simultaneous moments in cinema history that demonstrate moviemakers’ ability to respond to and impact society. The second was the artistic and political eruption of Soviet cinema, particularly advances in editing and montage pioneered by Sergei Eisenstein and Dziga Vertov, who used innovative approaches to capture the drama of daily life. The third was the development of independent filmmaking in America, which sought to counter the stereotypes often created by Hollywood, including films starring all-black casts, predominantly distributed to black audiences — otherwise known as “race films ” — and production companies formed by notable filmmakers like Oscar Micheaux, Sessue Hayakawa and Beatriz Michelena. Modern Times leads visitors to the largest of the second-floor galleries, The Studio System, which follows the bustle of the Hollywood assembly line from the advent of synchronized talking pictures in 1927 to the decline of the studio system in the 1960s. This gallery explores the fascinating dichotomy of the era: the “dream” of Hollywood spectacle and the “factory” that made it possible. Here, objects from the Academy’s collection, such as a backdrop from “Singin’ in the Rain” (1952), the doors to Rick’s Café Américain from “Casablanca” (1942), and the typewriter used to write Alfred Hitchcock’s “Psycho” (1960), as well as familiar faces and scenes from the movies will bring to life the myriad people and departments that came together to create studio movies of the time. Visitors will journey through the studio to explore the artistry and also the challenges of Hollywood during its “golden age.” This gallery also highlights many of the era’s most unforgettable stars, from the dancing talents of Fred Astaire, the Nicholas Brothers, and Rita Moreno to the dramatic presence of Humphrey Bogart, Gregory Peck, and Sidney Poitier, and icons of the screen like Greta Garbo, Dolores del Rio and Marilyn Monroe. As visitors move to the Museum’s third floor Rolex Gallery, they will enter into the Real World. This space will reveal how filmmakers responded to the tensions and challenges of a world changed by World War II. As filmmaking techniques became more and more adaptable, with lighter-weight and more widely available equipment, filmmakers everywhere took to the streets to capture their version of reality and share slices of life on screen. Whether creating fiction films or documentaries, they helped record and shape our history. Visitors will also encounter the rapid growth of independent cinema and the individual expression that characterized movements from Italian Neorealism and French New Wave to Indian Parallel Cinema and Brazilian Cinema Novo. But this is not only a story of the past: such approaches continue to impact and influence filmmaking to the present day. An homage to the Stargate Corridor sequence from Stanley Kubrick’s “2001: A Space Odyssey” (1968) — a sequence that brought together experimental film techniques and mainstream cinema — creates a mind-bending passageway to the final section of the exhibition: Imaginary World. With the advent of new tools and technologies, cinematic visions are now limited only by the filmmaker’s imagination. Visitors will be transported to unfamiliar worlds of the past, present, and future to encounter many of the most memorable and beloved movie characters, creatures, and destinations and to hear from the filmmakers themselves how they have pushed the boundaries of filmmaking to make the impossible possible. These films, despite their imagined lands and inhabitants, often provide a mirror that urges us look at ourselves and our own world in new ways. An endeavor of this scope requires a multi-disciplinary creative team, such as the one assembled under the curatorial leadership of Kerry Brougher and Deborah Horowitz, Deputy Director of Creative Content and Programming. Intrinsic to the development of the vision for “Where Dreams Are Made” is Rick Carter, Oscar-winning production designer for “Avatar” (2009) and “Lincoln” (2012). The creative team for the exhibition includes the Museum’s curatorial staff—Doris Berger, Acting Head of Curatorial Affairs; Jessica Niebel, Exhibitions Curator; Bernardo Rondeau, Associate Curator and Head of Film Programs; J. Raul Guzman, Assistant Curator; Dara Jaffe, Assistant Curator; Robert Reneau, Film Program Coordinator; and Ana Santiago, Assistant Curator — as well as producer Brooke Breton, “Avatar”; sound designer Ben Burtt, “Star Wars: Episode IV” (1977), “E.T. The Extra-Terrestrial” (1982); staff from the Academy’s Margaret Herrick Library and Academy Film Archive, Academy governors and members, the Museum’s advisory committee on inclusion, and a range of film scholars and filmmakers. Gallagher & Associates, specialists in interpretive and experience design, are bringing their expertise to the project in order to realize the design and installations. The exhibition will present more than 200 concept sketches, character designs, storyboards, layouts, cels, backgrounds, film clips, and immersive environments. A catalogue, film series, and public events will accompany the presentation, and unique Studio Ghibli merchandise will be sold at the Museum’s shop. In the Museum’s Hurd Gallery — a 34-foot-high project space dedicated to the work of contemporary artists and filmmakers pushing the boundaries of moving image media — will be a dramatic interactive installation by teamLab, curated by Kerry Brougher and Deborah Horowitz. teamLab is an interdisciplinary art collective based in Tokyo comprising more than 500 artists, programmers, engineers, CG animators, mathematicians, and architects. Transcending Boundaries presents a site-specific, real-time, ever-changing environment that allows the viewer to engage directly with the artwork itself. teamLab’s work looks toward the expanded possibilities of moving image and digital technology. Following Hayao Miyazaki, the Academy Museum will present “Regeneration: Black Cinema 1900-1970” in Ffall 2020. “Regeneration” will explore the visual culture of Black cinema in its manifold expressions from its early days to just beyond the Civil Rights movement. Co-curated by Doris Berger and Rhea Combs, Supervisory Curator of Photography and Film at the Smithsonian’s National Museum of African American History and Culture (NMAAHC), it will be the first exhibition of its kind—a research-driven, in-depth look at Black participation in American filmmaking. In addition to offering a critical exploration of Hollywood productions, Regeneration will highlight the work of independent African-American filmmakers and create dialogues with visual artists. The exhibition’s goal is to redefine American film history as it elevates this under-represented aspect of artistic production and presents a more inclusive story. “Regeneration” is the proud recipient of the Sotheby’s Prize. The Sotheby’s Prize is an annual award that supports and encourages museums to break new ground. The grant aims to recognize curatorial excellence, and to facilitate exhibitions that explore overlooked or under-represented areas of art history. The Sotheby’s Prize is awarded by a jury comprising Sir Nicholas Serota, Donna De Salvo, Okwui Enwezor, Connie Butler, Emilie Gordenker, and chaired by Allan Schwartzman. “Regeneration’s” curatorial team is collaborating with an advisory panel throughout the development of the exhibition. The panel brings expertise and experience deeply rooted in scholarship and filmmaking and includes Charles Burnett, filmmaker, Academy member; Ava DuVernay, filmmaker, Academy member; Michael B. Gillespie, Associate Professor, The City College of New York, Department Media Communication Arts; Shola Lynch, Curator, New York Public Library, Schomburg Center for Research in Black Culture, filmmaker, Academy member; Ron Magliozzi, Curator of Film, The Museum of Modern Art; Ellen C. Scott, Associate Professor and Head of Cinema and Media Studies, UCLA School of Theater, Film, and Television; and Jacqueline N. Stewart, Professor, The University of Chicago, Department of Cinema and Media Studies. To encourage visitors to explore, dive deeper, and directly interact with exhibitions, collections, filmmakers, and fellow film lovers, the Museum’s public programs will include panel discussions, symposia, gallery talks, and other public events. The 288-seat Ted Mann Theater will offer daily thematic and exhibition-related screenings, and special showings and events will be held at the 1,000-seat David Geffen Theater. Film programming is overseen by Bernardo Rondeau. In addition, the Museum will offer an innovative range of digital engagement platforms and interactives, including a groundbreaking app. “Where Dreams Are Made: A Journey Inside the Movies” (working title) is organized by the Academy Museum of Motion Pictures and is supported by Gerry Schwartz and Heather Reisman, John H. and Regina K. Scully, and in part by an award from the National Endowment for the Arts. “Hayao Miyazaki” (working title) is organized by the Academy Museum of Motion Pictures and is presented in collaboration with Studio Ghibli. “Regeneration: Black Cinema 1900-1970” is organized by the Academy Museum of Motion Pictures and is co-curated with a photography and film curator at the Smithsonian’s National Museum of African American History and Culture. The exhibition is the recipient of the Sotheby’s Prize and is made possible in part by grants from the National Endowment for the Humanities and the National Endowment for the Arts. 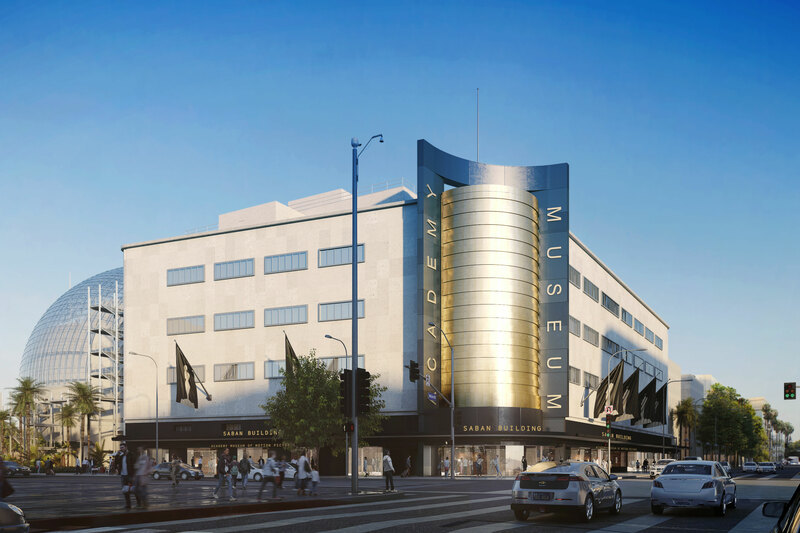 Designed by Pritzker Prize–winning architect Renzo Piano, the Museum is restoring and revitalizing the historic Saban Building — formerly known as the May Company building (1939) — at the corner of Wilshire Boulevard and Fairfax Avenue. The Saban Building will feature six floors, including exhibition spaces, the 288-seat Ted Mann Theater, an education studio, special event spaces, conservation areas, a café, and store. The new spherical addition will connect to the Saban Building via glass bridges and will feature the state-of-the-art 1,000-seat David Geffen Theater and the rooftop Dolby Family Terrace with its sweeping views of the Hollywood Hills.